The nVidia GeForce 6100 series chipset brings integrated video to the AMD Athlon64 n a low cost, fully integrated solution has been lacking for this stellar platform up till now. Since its arrival in late 2005, the GeForce 6100 'C51' GPU has been embraced by cost-concious users and system integrators. The Geforce 6100 chipset is technically a GPU, and that GPU is built by TSMC on the 90 nanometer manufacturing process. All current socket 939 AMD Athlon64/X2/FX processors are supported. Along with the native DDR memory controller built into the Athlon64 core architecture, the GeForce 6100 chipset will support up to 4GB of PC3200 DDR RAM over as many as four DDR DIMM slots. The GeForce 6100 chipset utilizes a 1 GHz 16-bit wide upstream and downstream Hyper-Transport connection between itself and the Athlon64 processor. The GeForce 6100 is a little less feature packed than the Geforce 6150 model, (the majority of these disparities relate to High Definition content) and thus does not support a TV encoder, TMDS/DVI, 1080p/1080i HD playback, high quality 5x4 video scaling or nVidia ActiveArmor firewall. Instead, video scaling is pegged at basic quality (2x2), and MPEG-2/WMV9 playback at standard definition (4:3) video playback. The Geforce 6100 graphics core operates at a slightly lower speed than its brethren, 425 MHz as opposed to 475 MHz. All Geforce 61XX-class chipsets support a total of 18 PCI Express lanes, 16 for the videocard and two for miscellaneous devices. In addition to the PCI Express x16 graphics slot, motherboards with the GF6100 chipset are only allocated a single PCI Express x1 slot, instead of two as with the GF6150. Here is a chart detailing the different combination of features pertaining to the Geforce 61XX-series chipsets available on the market. 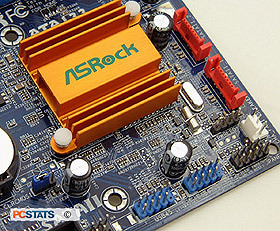 The ASRock 939NF4G-SATA2 motherboard falls under the third (6100/410), and most basic set of features. 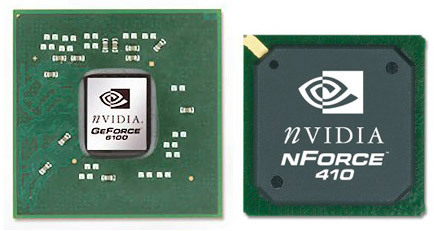 The nVidia GeForce 6100 is not a single chipset solution, and so it is combined with the nforce 410 Southbridge. The nForce 410 is Serial ATA II compatible (two ports), and can be configured for RAID modes 0, 1, JBOD. The Southbridge also works with Intel's new Azalia 7.1 channel High Definition Audio codec. The GeForce 61XX series graphics cards has two pixel rendering pipelines, so that right away should tell users the onboard graphics card is best only for casual gaming. It does however support the DirectX 9.0C standard as well as support for Shader Model 3.0, so the onboard videocard will work just fine with Microsoft's Vista upcoming 'Aeroglass' desktop. Perhaps the most important feature of both the Geforce 6150 and 6100 chipsets, PureVideo is what we'll be looking at next.